Sturdy Clipboard For Sound Or Camera. Authentic Crew Gear Camera Report Clipboard - Sturdy, yet flexable report clipboard made of plastic, covered in denier nylon with webbing foldback spine. Features: Metal alligator clip, slash side pocket, clear back pocket for sides, pen loop and velcro closure. 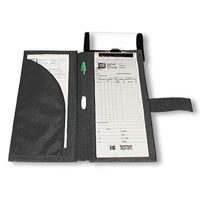 Removable clear plastic flap with velcro attachment to protect the reports from elements. When not in use, the cover is stored in its own clear front pocket.